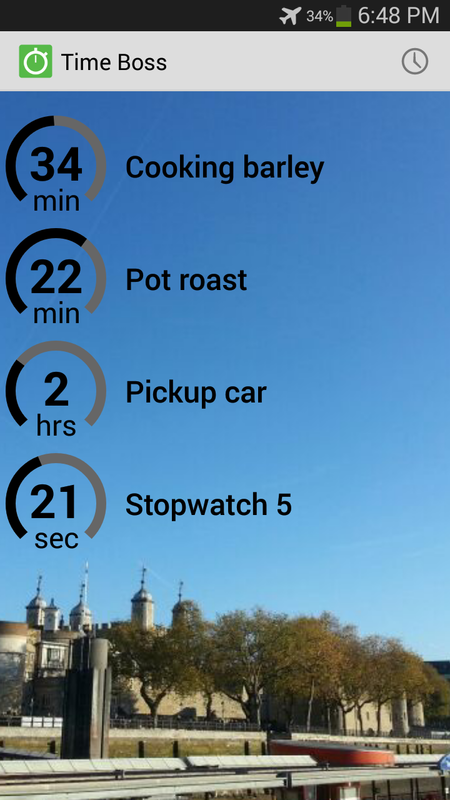 Who would think that there would be a timer app that was actually useful? I wouldn’t. Yet, after trying TimeBoss for a few days, I started to love it. It is easy to use and has some of the best thought out features of any timers out there. Let me tell you why I use this one daily. One of the great features is that you can make different sets of timers. I now have one for my cooking and some standard sets for monitoring online auctions. It also comes with several pre-installed sets to get you started. 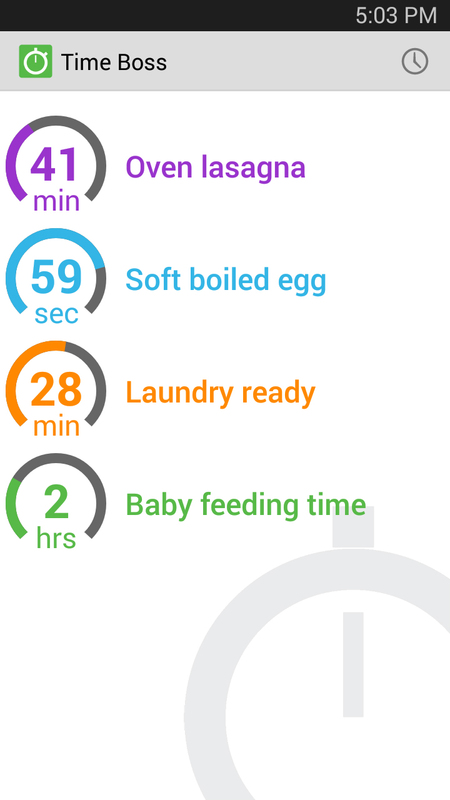 The pre-installed sets include cooking timers (egg timers, pasta cooking times, rice, beans, etc. ), workout timers (for running or fitness exercises) and a few random ones. As it turns out, this works great. Another great feature is that you can disable the timer by waving over your phone. Great for cooking, especially as it also works when the app is running in the background (black screen). No more dirty screens or pushing flower into the power button. The overall appearance is simple, but effective. All timers are shown clearly and it is easy to tell them apart. Timers can be given a different name, alarm sound and color. If you are feeling bold, you can even get a timer to trigger another timer when complete, for example to create a (workout) schedule. So far, TimeBoss has worked very robust. The alarms went off, also after the app is killed. I even tried to restart my phone completely, and all timers were still there and running at the correct time when I started the app. Pretty sweet. All of this in a free app with no advertisements. The pro version of the app comes with a widget that shows the value of the lowest timer number and name, which actually turns out to be really handy. It occupies just a single square (1×1) on your screen, talk about great real estate value! During launch (until the end of May 2015) the pro version is only 0.99 USD (0.50 EUR). 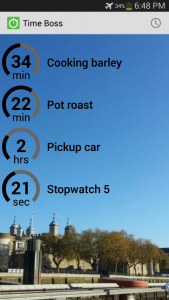 TimeBoss is the best timer app that I have encountered so far and comes highly recommended! Ultimately, TimeBoss is easy to use and it comes with a clear and intuitive interface with nice and vivid colors that makes it perfect for everyday tasks. We can use it for an enormous number of occasions and it’s perfect if you are busy or if you ever forget a task. It’s an easy to use stopwatch that lets you record total time and lap times. Data can also easily be saved to a text file on your phone for evaluation on a computer. TimeBoss is completely free to use and supports English, German, French, Spanish and Dutch languages. – Cooking: baking, boiling eggs, steeping tea, pressing coffee and dough rise times. – Sports: time you sets and planks, beat your time, apply ice or heat. – Games: do a timed quizz, set a restart timer to practice timed tasks. – Everyday: laundry, working out, picking up the kids, hair coloring. – Teaching: time breaks, recess and group work. 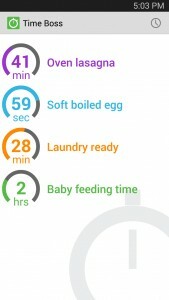 – Parents: baby feeding timer, time chores, playtime, reading time, bath time, time outs. – Medical: set a reminder to take your pills. – RSI: set a timer to remind you a take a break or look away from the screen. If you find TimeBoss useful I encourage you to buy the PRO version for only 0.99 USD (0.50 EUR) in order to support it’s development and it’s author!